​​​ ​​DALLAS-FORT WORTH – A surge in fourth quarter 2017 leasing made DFW the top office market in the country for 2017. 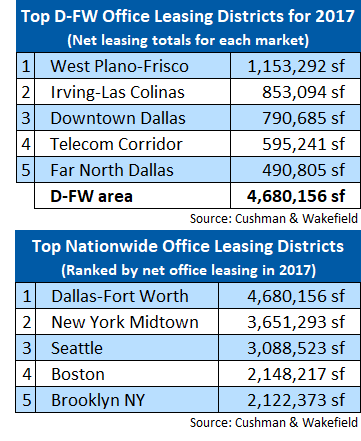 Expanding and relocating companies net leased almost 4.7 million sf of North Texas office space in 2017, according to a Cushman & Wakefield study. 2017's net office leasing—or absorption—was more than 38 percent ahead of the 2.9 million sf of local office space businesses occupied in 2016. DFW office demand last year was more than twice the ten-year average. ​Check out more DFW Office Market Research.